Results of the same finite element application running on different grids. P. Bastian, M. Blatt, A. Dedner, C. Engwer, R. Klöfkorn, R. Kornhuber, M. Ohlberger, O. Sander. A Generic Grid Interface for Parallel and Adaptive Scientific Computing. Part II: Implementation and Tests in DUNE. Computing 82(2-3):121-138, 2008, Preprint. Licensed under CC BY-SA 4.0. Simulation of a five-spot injection scenario with a strongly heterogeneous domain (SPE10 benchmark) using an IMPES formulation on an adaptively refined grid. For details see dumux. A CutFEM discretization of the EEG forward problem (Nüßing 2018). Simulated with the DUNE based duneuro toolbox. Simulation of the water flow field in the soil and the root xylem of a growing white lupin system. For details see Koch et al 2018. An unfitted dG cut-cell discretization of laminar flow at the pore-scale (Engwer 2009). Narrow water flux entering a heterogeneous unsaturated medium. Simulated with the DUNE based richards solver DORiE. The Interdisciplinary Center for Scientific Computing at Heidelberg University will host its annual DUNE and PDELab course on March 4 - March 8, 2019. The Python framework for hp-adaptive discontinuous Galerkin methods for two-phase flow in porous media was recently published. The paper presents a hp-adaptive Discontinuous Galerkin approach for two-phase flow in porous media. The implementation is based in the newly developed Python binding for DUNE and DUNE-FEM. A Docker image can be found quick testing of the available features. We are going to organize a user meeting in Stuttgart, at the conference hotel campus.guest at the Vaihingen campus of the University of Stuttgart. The Dune User Meeting will start on the 5th of November and will continue on the 6th. The Dune developer meeting will be held at the same venue right after the user meeting ending on the 8th. Details are available on the workshop webpage. The release of the dune-python dune-python module is accompanied by a recently finished article describing the mechanisms behind dune-python and providing a detailed introduction into its use. The first release of the new dune-python has finally arrived! 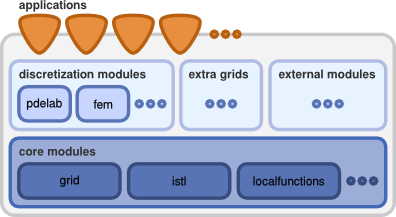 This module provides the general infrastructure for exporting realizations of statically polymorphic interfaces to Python based on just-in-time compilation as well as bindings for the central interfaces of the Dune core modules. This makes it possible to use Python to perform pre and post processing steps and to test new algorithms before transferring the code to C++. Adding Python bindings for additional modules and importing free standing C++ template functions is straightforward. In this first release, we focus on the grid interface. Some grid implementations residing in external Dune modules, like ALUGrid, SPGrid, and the new PolygonGrid, also provide Python bindings in the presence of dune-python. You can get the code by cloning the git repository and checking out the v2.6.0 tag or by downloading the source archive.